I never ever get cravings for something sweet. And purely salty food isn't that interesting to me either. The flavors that I go gaga for are bright, clean tastes, coupled with sour, bitter, or fermented notes, and an in-your-face blast of pure, sweat-inducing spiciness. In other words: Thai food. It's hands-down my favorite cuisine (with apologies to my Chinese parents), and our recent trip to Thailand only confirmed this fact. Everything we ate was so fresh, well-balanced, and full of flavor. I knew I was going to have to attempt to recreate some of my new favorite dishes once we returned home. Of all the Thai dishes, I think salads best illustrate the incredible interplay of flavors at which Thai cooks are so adept. The contrasting flavors of hot, sour, sweet, and salty tend to blend together more in a soup, curry, or stir fry. We ordered a salad at every meal, and of the dozens of salads we sampled, my favorite was easily the winged bean salad. Sliced winged beans are blanched briefly so they retain their bite. 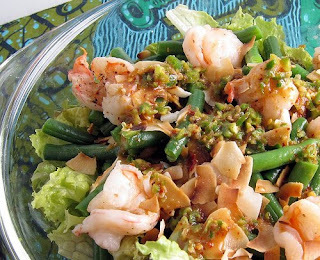 Then an addictive tamarind-based dressing is drizzled over the top, with a few grilled shrimp and toasted coconut flakes or chopped nuts for crunch. I searched high and low for winged beans in the Bay Area, but couldn't track them down, so I had to settle for green beans. The recipe is from True Thai, the best of the dozen or so Thai cookbooks in my rapidly growing library. To make the dressing, you will have to first make a chili-tamarind paste, which is a bit involved. But the paste keeps for up to three months in the fridge and can be used in anything from stir fries to soups for that authentic Thai touch. I include a few ideas for other uses at the end. 1. Soak the dried shrimp in a bowl of water. Rise briefly, then drain and set aside. 2. Heat oil in a heavy-bottomed saucepan and fry the garlic briefly (about a minute), until golden brown. Remove with a slotted spoon or Chinese spider to a plate lined with paper towels. 3. Fry the shallots until they start to brown (3 to 4 minutes). Remove and set aside with the garlic. 4. Repeat this process with the shrimp (1 minute) and chilies (30 seconds). 5. Place your fried ingredients in the bowl of a food processor along with the tamarind, sugar, and fish sauce and blend to a smooth paste. 6. 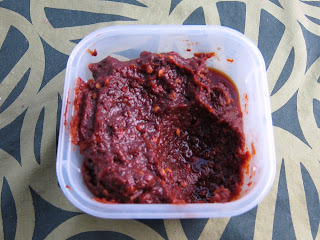 Transfer the chili-tamarind paste to an air-tight container and refrigerate. Note: The original recipe actually calls for holding the sugar and fish sauce back, then heating them along with the blended chili paste in a pan for 5-8 minutes until the sauce darkens. I did it this way the first time, then just added both ingredients in step 5 the second time. I actually sort of prefer the flavor of the quicker version, but I leave that choice up to you. Mix all ingredients in a bowl with a whisk or fork. 1. Bring a large pot of water to boiling. Blanch the beans briefly, about 2-3 minutes. They should be tender, but retain a bit of bite. Drain. 2. Toast the coconut flakes in a dry pan over medium-low heat until golden brown (about 7-8 minutes). Set aside. 3. Toss the shrimp with olive oil and a pinch of salt and pepper. Then grill in a heavy-bottomed pan for about 5 minutes, or until just cooked through. 4. 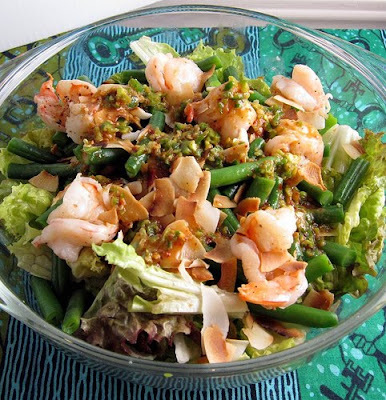 Combine salad greens, green beans, and cooked shrimp in a large bowl and toss with the dressing. Scatter the toasted coconut and chopped peanuts (if using) over the top. SOUP: Add two tablespoons of paste to six cups of chicken (or vegetable) stock along with fish sauce and lime juice to taste. Add straw mushrooms and protein of your choice (shrimp, chicken, or tofu) and heat through. Top with cilantro and sliced fresh chilies. STIR-FRY: Stir-fry about ten cloves of minced garlic in some oil. Then add two tablespoons of paste and a splash of fish sauce or soy to your favorite stir fry ingredients. Shrimp and baby corn is the combo that is featured in True Thai, but this would also be tasty with mixed vegetables (snow peas, carrots, bean sprouts, etc. 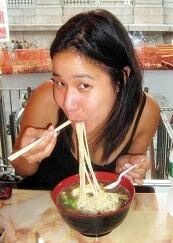 ), or slivered chicken and bamboo shoots. oh my favorite salad! sooooo delicious.